The measurement of well-being of people is very difficult because it is characterized by a multiplicity of aspects or dimensions. Principal Components Analysis (PCA) is probably the most popular multivariate statistical technique for reducing data with many dimensions and, often, well-being indicators are reduced to a single index of well-being by using PCA. However, PCA is implicitly based on a reflective measurement model that is not suitable for all types of indicators. In this paper, we discuss the use and misuse of PCA for measuring well-being, and we show some applications to real data. The paper is the result of the common work of the authors: in particular M. Mazziotta has written Sects. 2.1, 3.2, 4 and A. Pareto has written Sects. 1, 2.2, 2.3, 2.4, 3.1. Istat (2015a). BES 2015. Il benessere equo e sostenibile in Italia. http://www.istat.it/it/files/2015/12/Rapporto_BES_2015.pdf. Accessed 21 May 2018. Istat (2015b). Il benessere equo e sostenibile delle province. http://www.besdelleprovince.it/fileadmin/grpmnt/1225/pubblicazione_nazionale.pdf. Accessed 21 May 2018. Mishra, S. K. (2007). A comparative study of various inclusive indices and the index constructed by the principal components analysis. MPRA Paper, No. 3377. MPRA. http://mpra.ub.uni-muenchen.de/3377. Accessed 21 May 2018. Mishra, S. K. (2008). On Construction of Robust Composite Indices by Linear Aggregation. SSRN. http://ssrn.com/abstract=1147964. Accessed 21 May 2018. Shalizi C. R. (2009). The truth about principal components and factor analysis. http://www.stat.cmu.edu/~cshalizi/350/lectures/13/lecture-13.pdf. Stiglitz, J., Sen, A. K., & Fitoussi, J. P. (2009). Report of the commission on the measurement of economic performance and social progress. Paris. 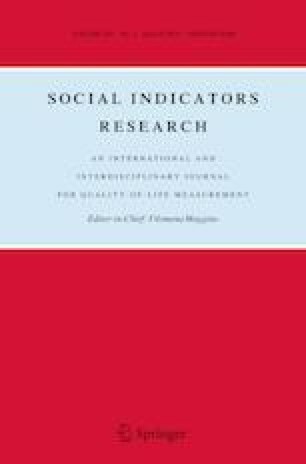 Available online from the Commission on the Measurement of Economic Performance and Social Progress: http://www.stiglitz-sen-fitoussi.fr/en/index.htm. Accessed 21 May 2018.